Page contents © TK Boyd, Sheepdog Software ®, 11/11. This tutorial is not written the way most of the tutorials at this site are written. It cuts corners. It panders to the "I don't want to understand what I'm doing; I just want the answer" crowd. You will be shown the basics of producing a database from a spreadsheet with Open Office. Please read the more comprehensive discussion I've written for you if you find the tutorial on this page insufficient for your wants. That is a "proper" explanation. Written using ooBase version 3.2.1 on Windows XP, but things should work the same way in other Open Office installations. This is not a "general" answer to moving data from an Open Office spreadsheet to an Open Office database. It is aimed at the "what do I click" crowd who have addresses in a spreadsheet, and want to print address labels. The first step is to move the contents of the spreadsheet into a database. The contents of each cell should be of reasonable length, and contain nothing "fancy". Open Office is capable of handling all sorts of weird and wonderful things, but if you want these "just click this" instructions to work for you, you have to Keep It Simple. Don't use commas in the cell contents. Copy them to the clipboard however you like to do that. Ctrl-C is one way. Launch the Open Office database. Perhaps the easiest way from here is to go to the spreadsheet's menu bar, click "File | New | Database"
You should see the Database Wizard, two panes: "Steps" and on the right one headed "Welcome to the OpenOffice.org Database Wizard"
Elect "Create a new database", click "Next". That should open a normal "Save As" dialog. Save it where you wish. Call it what you want. There are good places and names, but this is the limited guide. Bad choices will "work", up to a point. From the "Save As" dialog, you should be passed on to the Open Office database main project management window. 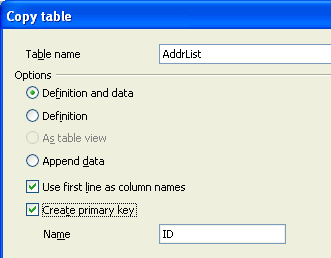 If "Tables" is not the selected button in the "Database" column at the left, click on "Tables". ... with buttons across the bottom, which I edited off to focus on the essentials. The image above shows things ready for the next step. From the default settings, I've supplied the "Table Name", and ticked the "Create primary key" box. This dialog is giving you a chance to be selective about which columns from the spreadsheet should be incorporated as fields in the database. On the left is available columns. On the right, the fields to be created in the database... at the point the screenshot was taken: None. You want them all, so click the second button down, the double right-facing arrow. You should see all of the column/ field names move to the right hand column. Click "Next". You probably should, but probably don't have to change the field type for every field except "ID" to "Text[VARCHAR]". (You may find that the field's are already of this type.) You do this by clicking on the field name in the vertical list at the right, and then working with the field type listbox. When that's done... click "Create". That's it! You have created a database table from some spreadsheet data! Now that you have the data in a database, my tutorial on printing labels should help. This has not been a typical Sheepdog Guides tutorial. It does not equip you to do more than follow a "recipe" which will work in certain narrow circumstances. If you want to learn about Open Office so that you can do more than that, please visit the main table of contents page for the Sheepdog Guides Open Office tutorials.